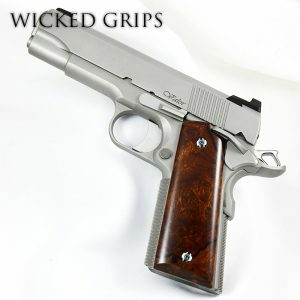 Our Handmade line of custom, exotic 1911 Wood Handgun Grips the fullsize standard frame Government model and the bobtail Commander models. Made right here Davison Michigan! 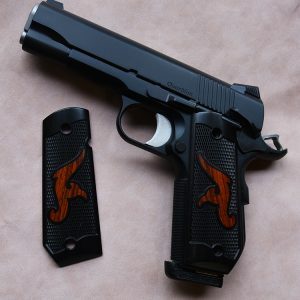 Every gun grip set is custom crafted and finished to a level of quality that matches the quality of your high value pistol. Using high end burl woods, ebony, gemstone materials and even Mokume Gane and Woolly Mammoth tooth & tusk! We offer a grip that stands alone in design and looks, giving you a truly unique quality grips set for daily use. Grips are pictured with our gem screws, not included, but available for purchase. Please see our care instructions on the FAQ page before purchasing. Not sure what frame size you have? Please watch the video!